Lulus Lovlies: HAPPY PINK SATURDAYS PINKY PEEPS! 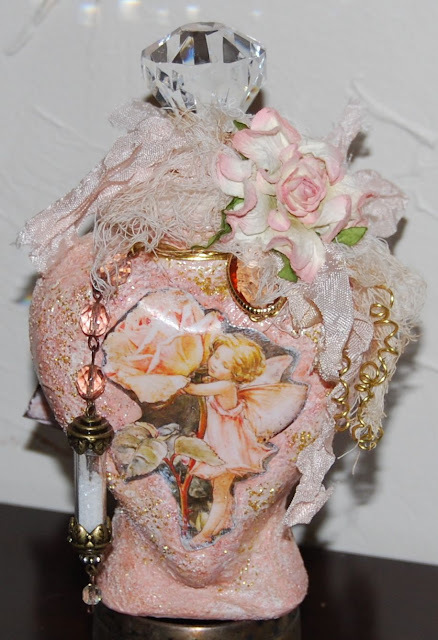 Happy Pink Saturday to all of you peeps, I'm a little late in getting up this post but here is a Birthday Dreams and Wishes bottle I created in one of my classes over at the Artful Gathering. I usually post my creations on my creative blog but this was a winner as it was just so "Pink" and a gift for the younger of the girls. The Rose Flower Fairy was a favorite of hers when she was younger and we used to read all the Mary Cicely Barker Flower Fairy verses when they would come for a weekend. This was intended to be a decorative keepsake for her and I included a tag pocket card on the back tied on with crinkled seam binding with a gift car included for a fun shopping spree before school starts. We celebrated their birthdays today with a BBQ birthday swim party at their Grandpas house as school starts next week. Now that they have their Fairy bottle gifts I can do the post as they usually check out Grams post once a week so I'm told so I can't post before hand. Sending Prayers to all affected by the storms across the country, and blessings to all of you peeps & bloggy friends where ever you may be. Don't forget to visit all the other pink peeps at How Sweet the Sound and I will announce the Giveaway winner from the miracle makeover Calling all Angels Post on September 3rd. Ohhh...what an absolutely gorgeous "fairy flower" bottle! I bet your granddaughter just adores it! What a creative and talented lady you are, my friend! Thank you for sharing your pretty with us. Thank you so much for coming by the other day and leaving such a sweet note! I so enjoyed your visit, sweet friend! Hope you're having a wonderful weekend. Yes, I'm sending my prayers to all of those who are effected by Hurricane Irene as well! Marilou, this turned out beautiful! You did a fabulous job. Oh this is just glorious. Pink fabulousness (I am sure there is not such a word lol). Hi Marilou, love your fairy bottle, it's so pretty and I know your granddaughter will love it too. Hope you have a wonderful Sunday! What pretty pink fairy wishes and dreams can be wished for in your lovely jar. Perfectly Pink. Marilou, the bottles are simply lovely. A treasure and a nice memory for your granddaughters. I love the photos of you and your husband, too ... more great memories! The dreams and wishes bottle is so very pretty. I know she had to be tickled pink to receive this. Happy Weekend to all of You Precious Peeps! "Calling All Blogging Angels! Giveaway Ends Soon!